It's really dark and looks just like what it is: painted appliances. I really fell for the photos on the website. To be fair, I'm sure they applied it much better than we did and so the appliances pictured probably look much better, but I really should have known better. I think it's a great idea and it really might be for some people, but it's not for me. I'm actually embarrassed of my kitchen now. BUT, I have found a little silver lining. Even though the finish looks terrible, I'm able to envision my kitchen with stainless steel appliances and I'm not sure if that's what I want any more. And how perfect would the matching stove be?!!! i'm so sorry it didn't turn out well :-( I really think stainless steel is over-rated (i know i'll get flack for that one) but I just fell in love with these vintage looking white ones! LOVE...save your pennies!!! Maybe an appliance party where everyone chips in $20?....ya - i know...that won't add up to much I suppose haha. Well, at least it was an inexpensive lesson learned! I only say that because you were planning on replacing the appliances soon anyway. In the meantime, work on your denial skills and pretend they don't bother you! Poor thing! Paint ur dishwasher the same color as your cabinets--that might look good. Real stainless is so gorgeous you can't compare this. A glass refrigerator would really look great. I feel so bad for you. You really don't deserve this!!!!? This sounds like something that would happen to me!! I feel your pain!! My husband and I were in the process of researching appliances. I want stainless, but the sales guy was really convincing towards just doing white. I like your white choices. I might just being doing the same. Sorry your paint didn't turn out how you expected it. Oh, I am so sorry! You are right to look on the bright side though! I have SS and I like it, but it isn't the only great option out there...and I think the others are catching on with consumers. I think you could be on to something with the white reproduction appliances, a friend has them and they are fabulous in her space! Hahahaha! I did exactly the same thing! And had exactly the same reaction! My friend's only comment: "Friends don't let friends faux..."
Big hugs to you! Isn't life hilarious? Sorry about the paint! Stainless looks great..if you don't have kids, or anyone with dirty hands...it's a devil to keep clean. My husband wanted white (for the lower price). Shuda, cuda, wudn't. I just clean more. have you ever thought about a chalk coal fridge? I just came across one and although it's a weird idea I think it might look quite cool in some kitchens. U can just use the frisge as a massive message board. And I have to agree that in your kitchen, white appliances look really good. Wow - how many times have I changed something that was perfectly fine (with a little voice in the back of my head warning me that I am going too far), with bad results! So sorry this happened on something as big as appliances. In my current home, the 22 year old appliances started to die so I got stainless, then my cabinets looked horrible and I had my cabinets painted white dove (Benjamin Moore). I am actually really pleased with how my kitchen looks, it is much better than it was before when I had pickled cabinets and black appliances - but now I realize that in my next house, I don't want to do stainless. I think it shows fingerprints too quickly, and I am worried that it will get a big scratch and ruin the whole look. I would like a panel that matches my cabinetry in the next house. So, sometimes it is good to experiment and really realize what you want. I was thinking the same thing as two of the posters above...Chalkboard paint! I have always wanted to do it...and it would work so well with your whole kitchen and house vibe...and its only another 10 bucks or so...you'll love it more, and in the meantime can save up your clams for your dream fridge! Your DW you could just add a panel of wood painted the same color as your cabinets. Hopefully your stove paint will come off. oh lauren, how sad. I feel for you. you know that wall paper I did in my bedroom, well, I ended up hating it. It came down this weekend. wasting money is never fun. OH NO!!! i laughed out loud though. b/c this is totally something i would do!!! my impatience and need for "right here right now" has gotten me in trouble before just like this. well, the bright side is i guess a new fridge and stove is sooner rather than later. but seriously....that is about as close to stainless steel as my hair is to real blonde. good luck lauren. you will be laughing about this one day. My aunt did this same thing, but with black paint and her fridge and stove look GREAT! I couldn't believe it. But I can see how the stainless looks terrible. Maybe you should try black for the time being??? Oh my. I'm so sorry it didn't work out for you. In theory, I can "see" it perfectly. I think the retro look will go marvelously in your kitchen - which, by the way, is STILL beautiful! P.S. **Also, love Linda's idea of the chalkboard fridge - your kids would love it! Could you still repaint this fridge with magnetic, chalkboard paint? Aw that stinks, I'm so sorry! I honestly don't think it looks that bad, though. And you're right; at least now you know that you might not want stainless steel appliances. Better to waste 50 bucks than 5,000! Aw, I'm sorry Lauren!! I've done projects like this sooo many times. Thinking something will be great in my head and knowing what I want it to look like, but of course it never comes out how I want it too. At least you look at the positive side, you are so good :) I hope you find a solution or a cheap one on craigslist that you like. Maria - If you aren't going to replace your refrigerator and stove for a while, I would do a couple things in the meantime to make it look better. Paint the sides of the fridge black - with the "hammered" spray paint. I would then paint the handle of the stove with the "hammered" spray paint. This might make it look better because it isn't all one solid color (giving the look of a quick fix). Just a thought to make it last until you can get what you want. I love that you stepped out and tried it. Most people never try! If I lived there, I'd be over this am with my coffee helping you! Really disappointing for you. It was so generous of you to let your readers know. I have considered using this myself. I'm glad that you gave us the information. I'm just sorry it didn't work out as planned. I can so relate to this. I sounds like something I would do only I would be "surprising" my husband with it and get into BIG trouble!! I'm sorry you aren't loving your kitchen right now, but I agree with some of the other comments. Do something crazy with it until you can get new ones! Your house is still beautiful!!! Sorry that happened, but good for you for trying! I am finally breaking out and trying new things - I used to be too afraid. Now I am happier and happier (even when things don't work out right). As for the fridge, I LOVE the idea of chalkboard paint. Saw a chalkboard fridge a couple of years back in a Cottage Living - it looked great! I salute your courage. Now you can show us all what follows stainless. Stainless will pass as everything does. Rachel Ray's husband had their fridge painted with Auto Paint to match their range. Maybe that's an thought. So sorry that your painting experiment didn't work out so well. It so sounds like something I would do. Definitely save your money so you can buy the Big Chill appliances though. They will look just perfect in your kitchen. Love your kitchen by the way. I went through the same problem recently and ended up with white appliances which I love! I think the stainless is over rated and quite possibly a trend that will look like avocado and harvest gold in the future. White is safe and always in good taste. Sorry about how things turned out. The sellers of our house put in the stove you have only in white right before we bought the house. It still had the tags and everything. We planned on replacing with stainless but we decided that after our kitchen reno the white actually looked better. We have the beadboard on the walls as well. Oh no you poor thing! I am going to echo another commenter's comment and say: stainless is over-rated. I am redoing my kitchen in my new home and I am purposely NOT doing stainess, or granite. OMG I was actually thinking bisque instead of white-white but it's too hard to match. But Joni is right, maybe look to make a wood PANEL for the dishwasher AND fridge to match your beautiful cabinets. ( ala the Painted Cottage I think it is... have you seen what she did w/her fridge? Its amazing! She panelled it in beadboard! )The look on craigslist and find a vinatge stove--- there are tons of them and really cheap. Good luck!!! Lauren - I am the queen on blotching my kitchen. My cabinets need to be replaced and my accent tile is horriable. I figure that if you are an innovative person and willing to take risks and be creative - you are usually going to come up with something new and fabulous. Once in a while the opposite will be the case so you have to be willing to take the risk anyway and roll with the punches. My last kitchen had stainless appliances and I hated the fridge becasue it showed everything! This time around I got the glass front refrigerator in white and I love it. I also love that it is different then what everyone else has. Frankly- it was more expensive then the stainless steal but oh well. ohhh-looks like I need to update that post. No way really, you are going to scrape it off!! You are a brave woman! 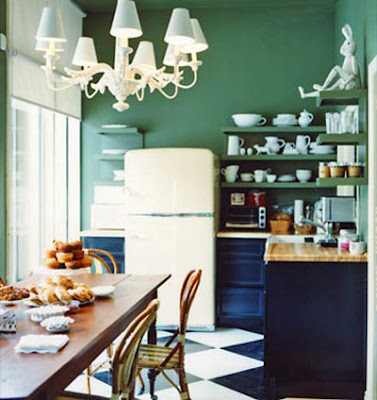 I would definitely do white because of the greeny gray cabinets you already have! So the silver lining is a good thing! You are so great, I love your blog Lauren! Sad for your appliances! My husband and I replaced our appliances last year. At first I REALLY wanted stainless, but as we looked at options, I ended up loving white so much more. I've never regretted the white appliances. They still look high end, and they just look so perfect in the kitchen. Oh I'm so sorry about your appliances! I love the vintage ones too. I saw a photo once of someone who covered their fridge doors in a sheet of stainless steel and it looked good. Best of luck with whatever you decide to do! Lauren: I meant to say to you in my first comment but forgot... that I totally understand your reluctance to go with stainless and instead stick with white appliances whether new or retro. My kitchen cabs are a creamy, buttery white that I love so much. To put glaring bright stainless next to them would #1 take away from the warmth and #2 break up the continuity of color that helps my little space appear larger. So it's white for me too. Just because something's all the rage (stainless, granite, vessel sinks) doesn't mean it's the right thing for your home. But I know you already know that! Lauren - I've recently seen a blog out there - I will find it for you but I just can't remember it rt now - maybe someone else wil read this comment and it will jog their memory if they've also seen - it was a "cottagey" blog and the owner covered her refrigerator in beadboard all by herself . It looked awesome. Since you have nothing to lose, you might as well try it. I'll search for it and e-mail you the link when I find it. Lauren - sorry I called you Maria earlier in my post. I had just talked to my good friend Maria and I had her on my brain! sorry that it didn't work out. We've always gone the black appliance route because we have small children with very oily hands. I hated the idea of cleaning stainless. I think black is sleek and modern without the fuss. Maybe you could use that Ready Strip product. I used it once on an old banisters and took the old varnish right off. There was some scraping in parts that I hadn't applied well enough. Give it a try. Good luck. LAUREN, YOU ARE DOING SUCH A GREAT JOB WITH YOUR HOME..I LOVE EVERYTHING YOU HAVE DONE WITH YOUR DECORATING. YOU HAVE INSPIRED ME TO START MY OWN BLOG AND KEEP CHIPPING AWAY AT MY DECORATING PROJECTS. DON'T WORRY, YOU WILL SOON HAVE THE KITCHEN OF YOUR DREAMS. I THINK THIS MISTAKE HAS OPENED YOUR EYES TO WHAT YOU REALLY WISH FOR. I am so sorry that this happened. I cannot imagine your disappointment. One of the things I like most about your blog though is that you have GUTS and you try things. Some designers stay so inside their little box of comfort ~ which is fine too ~ but everything is very homogenous and safe. I LOVE that you take risks. Sometimes they work and sometimes they don't but we always learn in the process. I applaud you and I really hope you can get the look you want soon. The kitchen is such an important room and it it the hub if family life. Lauren, let us know how this saga ends. We feel for you! Yikes! Well that'll put a damper on your day! I like the suggestions of chaulkboard paint for the fridge. Can the appliances be repainted white? Love the Big Chill appliances too. Oh no! I'm so sorry, but you're right to look on the bright side. You definitely saved a lot of money and now you have a better picture of what you like. I also think stainless steel is going to be on its way out. 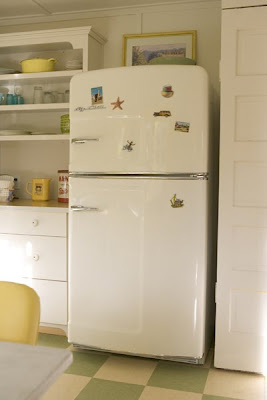 I don't think it will ever really look bad or completely go out of style, but vintage style fridges like the ones you posted about are so much more charming. It doesn't look so bad in the photo, but I do love the vintage looks - I think they would go great with the bead board and open shelving!!! Good luck - can't wait to see what you find! On the upside have you ever had to clean stainless steel appliances? Trust me you have saved yourself a life time of cleaning off fingerprints. It never looks clean so go with white! Sorry about the paint. You mist have a very understanding husband mine would kill me if i wrecked our perfectly fine appliances. Hey I had stainless steel and hated it. With three kids there were always fingerprints everywhere and I had to constantly polish it. Way too much maintenance for me. I would sooner have black or white, depending on the decor. Now I just have an ugly fridge that came with the rental house I live in and hate it everytime I look at it. So your "stainless" steel looks better than my ugly 15 year old fridge! I love the big chill. Do you think it would blend in with traditional? I'm posting for others that may still come here to view this post like I did to see that there is another option that does work without harsh live with results if you don't like it just PEEL IT OFF no commitment issues here! Lauren- I actually like it! and plan to do the same. Like you I'm in love with those vintage fridges from Big Chill and plan to buy one in two years when I remodel Big Time, until then - it's stainless steel paint for me! 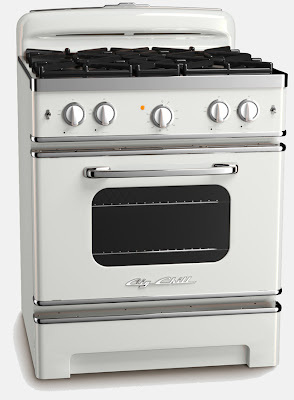 I agree that the Big Chill appliances are gorgeous, but they are VERY expensive considering they're ordinary otherwise. I bought a used Sub-zero fridge for a very good price. They are surprisingly common on CL; I guess rich folks can afford to replace everything whenever they want! 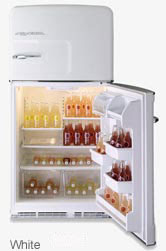 It is THE most wonderful refrigerator I have ever owned!! What I hate about it, though, is the aluminum (faux stainless, haha) finish. I was thinking of covering the front with oilcloth. Anyone ever done that? I may try the beadboard idea instead, although I won't be able to add hinges because the SZ hinges on top of and under the door. I agree with Victoria suggesting the use of wood panels! I want the appliances to recede rather than jump out visually, like ss and all black or white can. Never been a fan of the ss look anyway, it is so clinical, but weirdly most consumers demand it-even after 40 years. I had matching hickory panels installed on our side-by-side fridge and DW to our cabinets 13 years ago and never regretted it. Having a refrigerator professionally sprayed to match the dominant kitchen color also works- just paint handles black or replace them.